Lots of terrible things happened during the French colonisation of Vietnam during the 1900s. You know: invasion, oppression exploitation. But then came independence! And when France gave Vietnam back to its people, it threw in its classic baguette recipe. 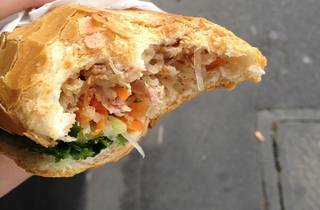 The banh mi is a French baguette, with Vietnemese style fillings: meat (or tofu), fried shallots, pâté, cucumber, chilli, coriander, grated carrot. 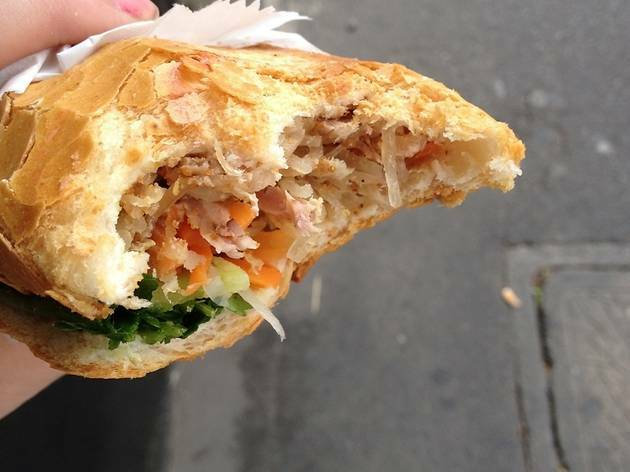 Ask a Footscray local what they eat for lunch, and most would tell you to fetch a banh mi. And where from? Our recommendation is Nhu Lan. Pictured banh mi with shredded pork skin. It’ll cost you less than the train ticket you bought to get there, too.